I’m typing this on a Macbook Pro with a “retina” display, and it’s breaking my heart. Having used it as my main machine for the past fortnight, in a few hours’ time I’ll have to wipe the hard drive, find the cables, and send it back to Apple. The world is going to go fuzzy again. Is this what it’s like for people who wear glasses when they lose them? OK, I’m back on my old machine now – with its standard display resolution of 1280×800 on a 13″ screen. That works out to about 104 pixels per inch. Here’s the fact of it: with the “retina“ display on the “new iPad“ (aka iPad 3, aka the version released in January of this year), you had to put it side-by-side against another one to see the difference (something Gawker exploited wonderfully by giving people an old one and telling them it was a new one and filming their delight… and then telling them the truth). The difference on this display leaps out at you. It shouts at you. “Retina-optimised“ programs (especially browsers, but text and film and picture editing too) leap out at you, and demonstrate the precision. It has 220 pixel-per-inch precision, and wow, it’s really stunning. Pictures on websites can’t do it justice, because they’re on websites, and those are only 72ppi, typically. Even TV can’t really show you. Ironically, I can’t show you any screenshots demonstrating the difference effectively, because we only do pictures at 72dpi – not the 144dpi that the “Retina MacBook Pro“ (RMBP from here on) offers. Well, I can contrast how it appears on a browser (Google Chrome) that doesn’t take advantage of the RMBP’s text rendering, against another browser (Google Chrome Canary – the bleeding-leading edge version of Google Chrome; I found it very solid). Comparing the same site in a “retina-ready“ browser and one which is not. Click for larger version. See? There’s a real difference. But that doesn’t tell you what the experience is like. Now, you might not use a Mac, and have no interest in doing so. Even so, you’re likely in the next few years to benefit from Apple’s decision to showcase high-resolution screens on its high-end laptops, because there’s a high probability that that will first start appearing on more high-end laptops in the Windows world, and then – let’s hope – on the cheaper ones. But that’s not the only way that the RMBP is leading the pack. It’s basically a showcase by Apple for all the best things in laptops today. The display is the standout feature (obviously, since it’s what you deal with), but that’s not the only thing that’s attractive about this machine. In terms of thickness, it’s nearer to the MacBook Air (and “true“ ultrabooks, hard though those are to find) than the MacBook Pro. In heft, it’s not significantly heavier (2.02kg, 4.46lb) than an older MacBook (2.99kg). Again, it’s in between the “standard“ MacBook Pro laptop and the MacBook Air (1.35kg). The 15in screen, though, is bigger than you can get on a MacBook Air (only 11in and 13in there). And when you open the lid, the screen seems to fill the entire space; the glass reaches to the edges, and though the bezel is obvious once it’s illuminated, the feeling of being immersed in the screen is very powerful. It’s also bright. Flash drives are what you’ll have in your computer in five years or so. Per-gigabyte prices are dropping precipitously, while those of hard drives have actually risen over the past year because of last year’s floods in Thailand. Apple offers three configurations – 256GB, 512GB, and 768GB. It also says that the throughput is three times faster; I asked whether this was due to its (rumoured, but pretty much confirmed) purchase of Israel’s Anobit last year. As is the Apple way, I got a blank stare, rather like someone who’d just had their memories wiped in Men In Black; they wouldn’t say. It seems a good bet, though. I never managed to stress the machine; the Ivy Bridge CPU and NVidia GeForce GT 650M graphics card simply laughed at my simple text ways. Really it’s built for heavy-duty pixel-pushing such as video editing, and I did demonstration machines simultaneously running four HD video streams, and switching between them. If you wanted to do real-time editing in the field, this would be the machine to do it on. The fact that it also uses a Flash drive means you’ll get a far faster throughput. Other laptop manufacturers have been reluctant so far to adopt Intel’s Thunderbolt technology, which allows you to chain displays and hard drives together – rather like Apple’s proprietary Firewire did (with hard drives and disc burners). It has a throughput of up to 10 gigabits per second (Gbps) and can drive multiple displays. Finally, Apple is offering this. (It’s now also on its lower-end MacBook Pro models.) Nice to have caught up with the Windows fraternity – or majority. Apple seems to have ignored USB 3.0 so that it could focus on Thunderbolt. Now the latter is settled, it’s catching up elsewhere. Wired connections are a thing of the past, apparently, or should be. You can buy a Thunderbolt-Ethernet adaptor/connector, but the idea that you’d connect your professional-class laptop to a wired Ethernet is apparently too retro. Ethernet jacks are too fat and old; only slim Thunderbolt jacks (able to shift up to 10Gbp/s, mind you) count here. There are no lights on this machine. 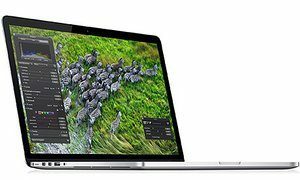 Since about 1999, Apple laptops have had a little light on the front which, when the lid is closed, indicate whether it is “sleeping“ (in the Suspend state) by pulsing slowly. If there’s no light, the machine’s off. Here, though, no lights. (OK, there is a light on the power cord connector, to indicate whether the machine is charged or charging.) The assumption seems to be that you’ll always put it to sleep, and it will never run out of battery before being reconnected to a power point. Apple suggests it’ll get up to 30 days standby time. The lack of a light makes no difference to everyday use – unlike spinning drive machines, where you needed to wait for the drive to spin down before moving it (in case you caused a head crash), Flash drives don’t care about movement, so you can shut the lid and the “suspend state“ data gets written whether the machine is moving. This difference is really interesting, especially when you compare it to many Windows laptops, which have blue lights, green lights, red lights – it’s like the Las Vegas strip once the hard drive gets working. Perhaps we needed reassurance that the hard drive hadn’t died in the old days, hence the lights. Now, it’s lights-out. Although you can install Windows 8 on this device, and it will run perfectly well, and the Windows 8 elements will be sharp, the text itself doesn’t get the fine-grained sub-pixel rendering, according to PC Pro, who have been trying it out. But, equally, now that Apple has shown the way it’s very likely that other PC manufacturers will follow, and try to push high-end machines with these capabilities. If they want to keep any clients in the photographic business they will, because once any of those use one of these for any period, they’ll not go back to a normal screen. Well, it worked (eventually) with the MacBook Air, imitations of which (with Flash drives) are busting out all over in the form of ultrabooks. High-res displays are sure to follow as manufacture gets cheaper.